In a Nutshell: With roots stretching back more than 160 years, United Bank now operates nearly 60 branches in communities in Connecticut, Massachusetts, and Rhode Island. United Bank owes its longevity to its personalized approach to banking that fulfills the needs of consumers and businesses. The organization matches its customers with the financial tools they need to succeed, and its consumer and business credit card products have nothing to envy those offered by the largest Wall Street banks. That neighbor-helping-neighbor philosophy has helped United Bank grow into the largest Connecticut-based community bank with more than $7 billion in assets. In 1858, in the small town of Rockville, Connecticut, 20 business owners pooled $175 to start Rockville Bank to finance home mortgages in the area. Acting as an agent of commitment and community cohesiveness, through good times and bad, the bank enjoyed steady growth, decade over decade. Almost 25 years later, another bank was established in the nearby town of West Springfield, Massachusetts and embarked on a similar path, one in which neighbors helped neighbors put down roots and build livelihoods that could be sustained over generations. By the end of the 20th century, West Springfield-based United Bank had become a $2.4 billion public company with 37 branches serving customers in Massachusetts and Connecticut, and Rockville Bank had become a $2.1 billion public company operating 22 branches and headquartered in the town of Glastonbury, Connecticut. A lot had changed, but modern financial consumers in the Northeast still wanted more. They needed services on par with the largest Wall Street banks but with the benefits of a local organization that reflected the values of small-town New England. Brandon Lorey, EVP and Head of Consumer Banking, highlighted United Bank’s robust credit card offerings. 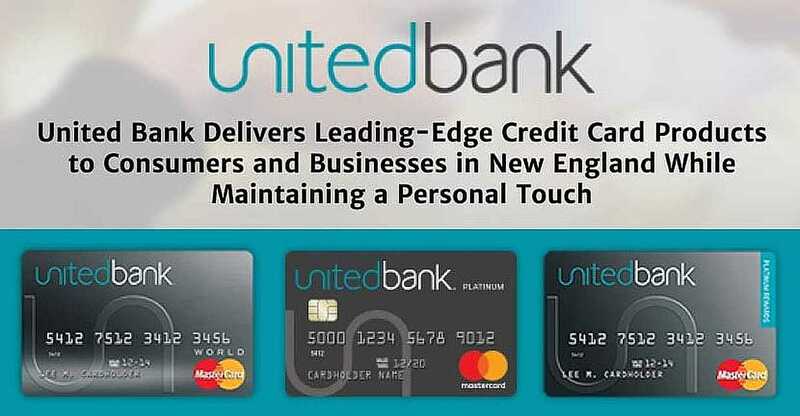 The trends in consumer banking led to the 2014 merger between the two esteemed New England institutions which formed today’s United Bank. Based in Connecticut’s capital, Hartford, United Bank now manages more than $7 billion in assets and operates 58 branches. And though it brings customers the benefits of modern technology and a full range of services designed to meet a variety of needs, United Bank hasn’t forgotten where its roots lie. While its neighbors-helping-neighbors philosophy has remained a core value, United Bank serves customers across New England who have diverse financial goals. The bank has stepped up with a portfolio of consumer credit card options that provide the same flexibility as cards offered by many Wall Street banks. Customers can choose from various features, including lower interest rates, rewards points, and even concierge services. Many customers look to the United Bank Mastercard® Platinum card not just as they’re beginning their personal financial journey but also in times of debt reorganization. The card carries a 0% introductory APR on balance transfers and purchases for six months. Then, over the life of the card, creditworthy customers enjoy United’s lowest APR, which makes it ideal for those looking to carry a balance. Its next-tier offering is the United Bank Mastercard® Platinum Rewards card, which allows cardholders to earn one reward point for every dollar spent, redeemable either as a statement credit or travel and gift cards. Points are even available for use as charitable donations. The card offers a one-time bonus of 5,000 points to customers who spend $1,000 on the card within the first three months. United Bank’s consumer credit cards offer customers buying power, security, and personal service. The United Bank Mastercard® World increases those rewards benefits, earning customers two points for every dollar spent on travel and dining along with a point per dollar on all other purchases. Cardholders who spend $3,000 on the card within the first three months earn 10,000 bonus points. This card offers higher credit limits and complimentary 24/7 concierge services as additional conveniences for cardholders. And United Bank works with its customers to find the right fit for their financial situation. United brings the same sort of flexibility to its business portfolio. Structured to parallel its consumer offerings, United’s business credit cards put administrative control in the hands of business owners. For busy managers and entrepreneurs, that can mean much less time spent on the phone with United Bank. Like United’s entry-level consumer offering, the Mastercard® Business Platinum card offers a 0% introductory APR on balance transfers and purchases and then a low everyday rate based on creditworthiness. United Bank makes any number of cards available at no additional cost, and businesses can choose between consolidated and individual billing. “It’s all about empowering our business clients to transact the way they want to and not how the system wants them to,” Brandon said. With the Mastercard® Business Platinum Rewards card, businesses can earn a point for every dollar spent. Those rewards can be redeemed for office supplies, equipment, and travel that can supplement everyday business costs. In the next tier is the Mastercard® Business World card, which is aimed at corporate road warriors. It rewards two points for travel and dining expenditures and offers 24/7 concierge services to help book reservations and locate hotels for the most avid business travelers. “Businesses that move into our rewards cards are not just simplifying the accounting and administrative processes associated with transacting, they’re earning revenue,” Brandon said. Whether on the consumer or business side, none of United Bank’s cards carry an annual fee. Holders have 24/7 access to their accounts, phone support, and are protected against fraud and identity theft. They also gain the benefit of working with a financial institution that looks at them first as people and then as customers. And that means a relationship based on more than credit score. United Bank also stands ready to grow with its customers as they move through financial stages. “Based on what we observe with our customers, we’re always looking for opportunities to help them to upgrade and gain additional flexibility and benefits,” Brandon said. And as the world continues to grow more complex, that type of responsiveness is what more and more customers crave. It’s a sense that they’re dealing with someone on a personal level, not with a bureaucracy. As the largest Connecticut-based community bank, United is uniquely positioned to fill that role in its service area.